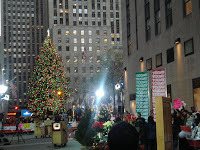 Just to update the trip to the Today Show this morning. We didn't make it into any of the crowd shots that I'm aware of but we did run into the photographer who takes pics of the signs in the crowd and posts them to the MSNBC blog. Take a look at our "double take."